Accursed Spawn was founded in Ottawa in 2010 with a singular purpose: to transform raw aggression into music. 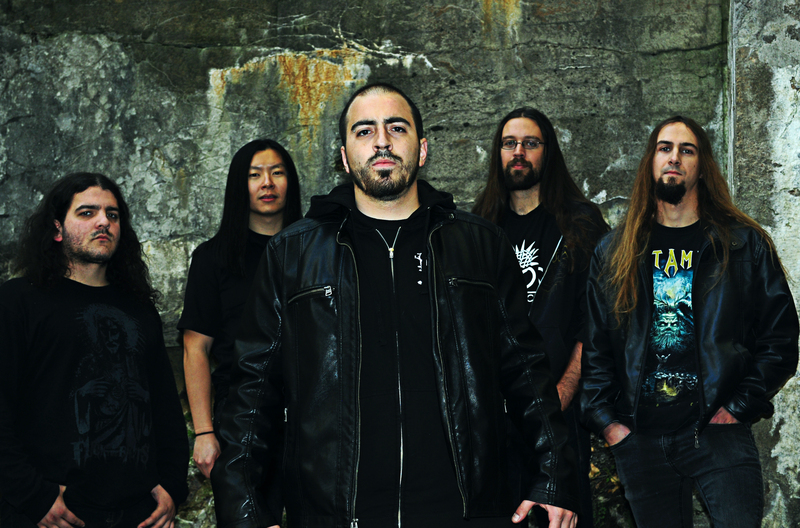 The band mixes influences from old and new forms of extreme metal, resulting to date in a renowned energetic live show, and a handful of recorded songs. Whereas many bands remain on one creative trajectory, Accursed Spawn has taken the path less traveled and would see their sound evolve through time. The band has strived to form a unique sound and style that stands apart from the crowd. This has taken the form of a mix of demos and EPs since 2010 as the group methodically worked their way towards the finessed and intricate sound they now wield in weaponized form. Accursed Spawn prides themselves on professionalism, and their upcoming album “The Virulent Host” is a testament to that ethos and is the natural next step in the evolution of the band’s musical expression. While many releases are rightly viewed as a mere “snapshot in time” of where a band is, “The Virulent Host” represents a fully realized vision culminating years and countless hours spent to realize their greatest musical potential to date. The end result is a fiery and passionate take on modern death metal, influenced by thrash and brutal death that stands head and shoulders above many of their contemporaries. “The Virulent Host represents a huge step up in all ways for Accursed Spawn: the production is exceptional (thanks to Christian Donaldson and The Grid), the hooks are quite memorable, the string work is phenomenal (between the blistering solos and fretless bass, there’s quite a lot in there for string players), and the delivery is both consistent but also fresh. It’s our first ever “full length” record and fans that have been with the band since our inception should be quite pleased with the delivery. We’ve road-tested most of the songs at this point, and the mosh pits speak for themselves.” says drummer Jay Cross. With the band re-tooled and re-vamped line up, “The Virulent Host” is being planned for a 2019 assault via PRC Music with their first single Accursed Spawn has gone all-out to ensure the highest quality product on this album. “We want to offer an intense, yet rewarding listening experience for both musicians and non-musicians alike. Fast, dextrous playing coupled with subtly melodic compositions that can be enjoyed by both the trained and untrained ear. Out first single “Bhopal 84” will give a good deal of insight into what people can expect from this record: it kicks off with blistering guitar and drum work, jumps into a catchy verse, and presents a very slamming bridge near the end of the song, followed by tasty solo work. It has a nice “Suffocation meets Cryptopsy” feel but is still uniquely Accursed Spawn.” adds guitarist Adam Pell. Utilizing several world-renowned talents in multiple realms, they have brought vision to life in the strongest way possible. Much-praised audio engineer Chris Donaldson, guitarist for legendary death metal unit Cryptopsy, was tapped to infuse “The Virulent Host” with a production quality that truly stands among the titans of death metal. Applying his talents and experience, Donaldson mixed and mastered the album at The Grid Studios in Montreal. Donaldson has previously worked on records for high profile names such as Cryptopsy, Beyond Creation, Despised Icon, The Agonist, Beneath the Massacre, and Neuraxis. In addition to the album recording, Accursed Spawn recruited highly esteemed artist Remy Cooper of Headsplit Design (Origin, Beyond Creation, Psycroptic, Pig Destroyer, Whitechapel, Thy Art Is Murder, Cryptopsy, Suicide Silence, Arch Enemy) to create the rich stylized artwork for “The Virulent Host” – a piece that immediately draws attention to the eye. The artwork captures all of what the album is about, a raging narrative of war and corruption plus the dialogues within influenced from the political turmoil and evil corporations that have a stranglehold on our society. “The Virulent Host” is slated for March 22, 2019 release via PRC Music. Listen to their first single “Bhopal 84” here.